Another country, another ginger-centric recipe. I suppose you could consider this a grown up version of jello: it has a more sophisticated flavor and a softer, more pleasant texture. The recipe that inspired this one was drizzled with brown corn syrup. Had I thought that was the right flavor match for the ginger, I would have risked angering the pitchfork-wielding anti-corn syrup mob. But the truth is, I just thought a honey and molasses mixture was more interesting way to finish off the dessert. Molasses is such a strong flavor that it can quickly overwhelm the honey. Start with the 3 to 1 honey to molasses ratio, although you’re welcome to make adjustments from there to make the molasses flavor more pronounced. In a medium saucepan, combine the ginger with 3 cups of water and bring to a boil. Reduce heat, set the cover on slightly askew and simmer for 20 minutes. Remove the ginger slices and discard, or set aside to re-use. The should be about 2 1/2 cups ginger water. Add sugar and stir until dissolved. Pour 1/4 cup of water into a small bowl and sprinkle the gelatin on top and let soften. 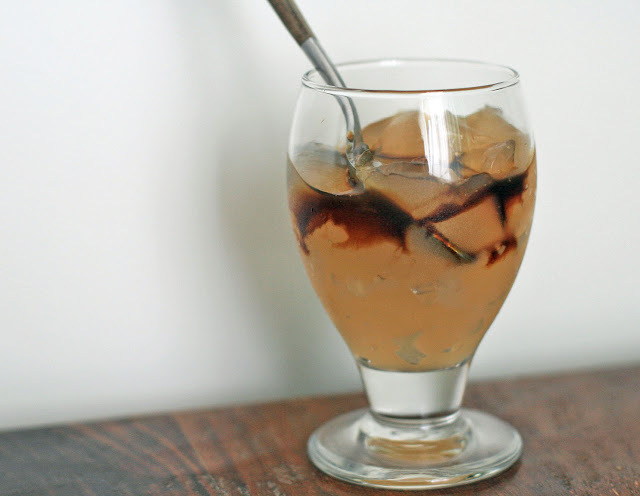 Stir the gelatin water and the lemon juice into the ginger water and stir until the gelatin is dissolved. 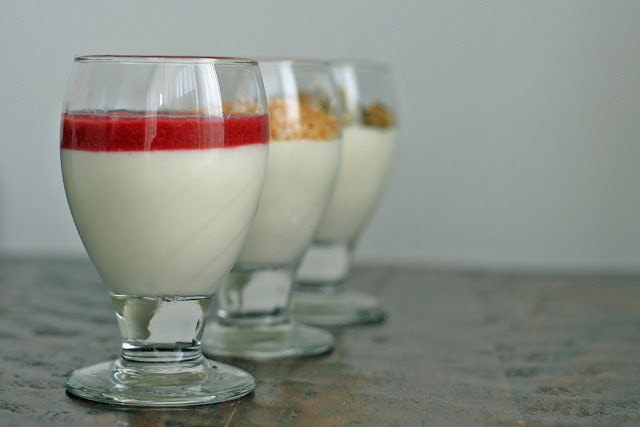 Divide the mixture between four dessert bowls or glasses. Chill for several hours in the refrigerator until set. Just before serving combine the honey and molasses in a small bowl or ramekin. Drizzle on top of the jelly. Note: If you’d like small squares or pieces of jelly instead of a solid mass, pour the hot ginger mixture into a wide, shallow serving bowl or dish. Chill for several hours or until firm and cut into small cubes or pieces. 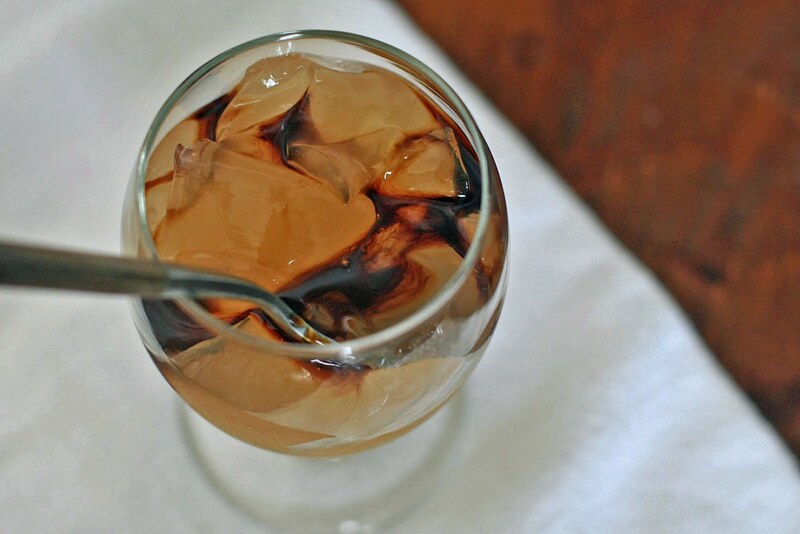 Divide among the bowls or glasses and drizzle with honey molasses syrup. This is exactly the type of dessert I generally avoid. Namely because it relies on one critical step that I usually botch: unmolding the soufflé. Per usual, I didn’t do it correctly. And so I give you pictures of the back-up soufflé, which I didn’t even bother trying to flip. Botched unmolding aside, this coffee soufflé is the perfect dessert to follow a heavy meal. Firstly, because those whipped egg whites keep it nice and light. Secondly, because it provides a caffeinated pick-me-up. Two quick pieces of advice: whip the egg white immediately prior to folding them into the coffee mixture (you’ll want to make sure the coffee mixture has already thickened) and follow the unmolding tip at the end of the recipe. I think it would have saved me a lot of frustration. In a medium saucepan, combine the coffee, 1/3 cup of the sugar, the gelatin, and half-and-half over low heat and cook, stirring occasionally, until the gelatin has dissolved. In a separate bowl, lightly beat the egg yolks with the remaining 1/3 cup sugar and the salt. Temper the eggs by whisking a little of the coffee mixture into the egg yolk mixture. Pour into the saucepan and continue to cook over low heat, stirring frequently, until the mixture thickens slightly. Remove from the heat and stir in the vanilla. Let cool, stirring often. 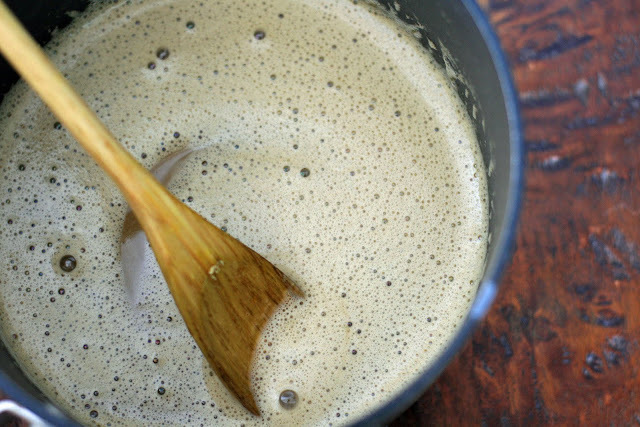 When the coffee mixture has thickened, beat the egg whites in a large bowl until soft peaks form and carefully fold into the coffee mixture until blended. Pour into a decorative mold or individual dessert bowls or glasses. Cover and refrigerate until set, at least 4 hours. To serve, invert the soufflé onto a plate to unmold (or just keep as-is if in individual dessert glasses or bowls) and garnish with whipped cream and chocolate syrup. Note: A tip from the author to help unmold the soufflé- soak a clean kitchen towel in warm water, wring out, and wrap around the mold for 2 or 3 minutes to loosen. 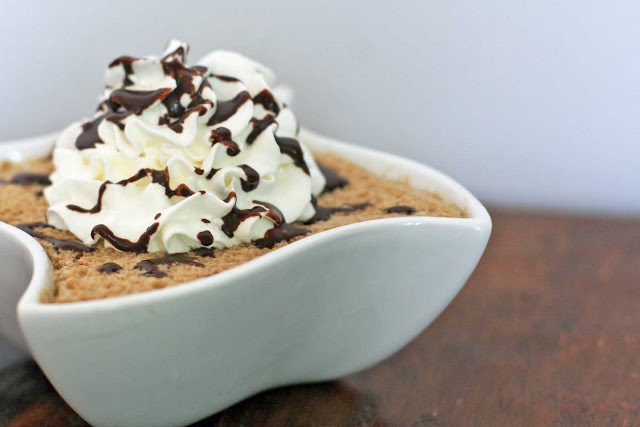 This dessert is about as sophisticated as a Snack Pack Pudding cup. I don’t necessarily mean that as a bad thing- I was eating those Hunt’s snack pack puddings well into my adult working years. Hunt’s doesn’t make (to my knowledge) a coconut pudding, but I imagine this is exactly what it would taste like should they ever add it to their line-up. It’s a fast recipe using a bunch of unfussy ingredients that you probably already have in the pantry. Perfect for when you want to reminisce about the days when you’d get excited that your mom remembered to pack you a dessert. In a medium saucepan, dissolve gelatin in water over low heat. Stir in coconut milk and remove from heat. Add sweetened condensed milk and salt. Pour into dessert dishes and chill. 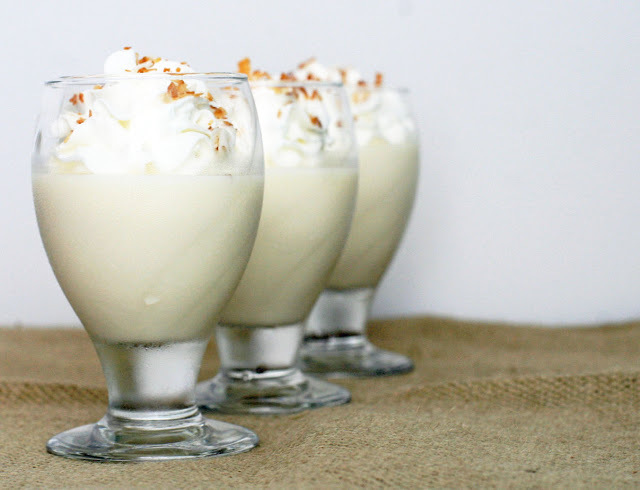 Top with whipped cream, nutmeg and toasted coconut to serve. Did you guy see the post on Serious Eats about the blogger creating burger recipes for every country in the world? I feel like I read somewhere that it was to introduce the author’s non-adventurous family members to different cuisines. Well, I imagine that when she gets to Jamaica, her burger recipe might end up looking something like the meatball recipe below. These would be perfect for your favorite non-adventurous eater– the jerk seasoning makes it a little different than your standard meatball but it’s not so crazy that it’ll be outside anybody’s comfort zone. Great in a sandwich. They’re also a nice—and more mild—complement to those fiery roasted jerk potatoes that I posted a couple days ago. Mix the beef, onion, garlic, egg, breadcrumbs and spices and knead thoroughly. Shape into golf ball-sized meatballs and arrange in a single layer in a baking dish. Bake for 10 minutes. While the meatballs are baking, combine the ketchup, brown sugar and apple cider vinegar to make the glaze. Drain meatballs. 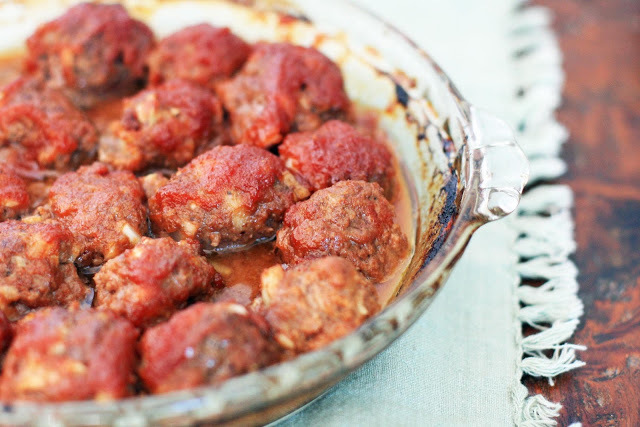 Pour sauce over the partially baked meatballs and bake another 20 minutes, or until meatballs are thoroughly cooked and the sweet ketchup sauce has baked into a thick glaze. One can only imagine whether UB40 would have had the same success if they’d titled their hit song Red Red Stew as opposed to Red Red Wine. Yep, I just pulled an Elaine (War and Peace, aka War, What is it Good For? Anybody? Anybody?). Anyways, back to the food. This is exactly the kind of recipe that I set out to find on my worldwide cooking adventure. Hearty, healthy, vegan recipes. No, I’m not giving up my dairy or meat just yet (giving up gluten was hard enough), but I’m all for trying to cut back. Red-Red is a common Ghanaian stew that’s named for the combination of red palm oil and red tomatoes. Red and red. But red palm oil is hard to come by in a lot of parts, Hawaii included, so I substituted the red palm oil for some vegetable oil, paprika, and cayenne. I guess that technically makes this Red-Red-Red stew. My vegan friends, please don’t hold it against me that I caved and ended up using shrimp paste. 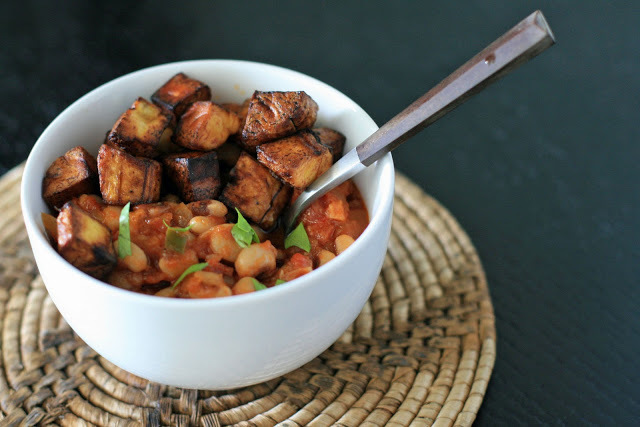 It’s really easy to make this stew vegan- just use your favorite vegetable bouillon. I really think you guys will like this one. Also, unless you are a verified cilantro-hater, the cilantro is really essential here, adding a nice pop of fresh to the dish. And yes, the plantain pillows do take a little extra time and effort but you’ll be rewarded with dreamy little packages of sweet starchiness that really go perfectly with the stew. Rinse and drain dried black-eyed peas. Place in a medium saucepan, cover with several inches of water and bring to a boil. Reduce heat to low and simmer until tender, about 30 minutes. Drain and put aside. Heat oil in a large saucepan over medium-high heat and cook the onions and garlic until they begin to brown. Add the ginger, paprika, cayenne, and Serrano peppers and cook, stirring, for several minutes. Place the tomatoes in a blender or food processor and pulse several times. You want some chunks left. Add to the onion mixture along with the bouillon (or shrimp paste) and stir. Turn the heat to low and simmer for 10 minutes. Add the black-eyed peas and simmer another 10-15 minutes so that the flavors can meld. Add the cilantro, stir and simmer another minute. Season with salt and pepper. Top with plantain pillows (recipe follows). Cut plantains into 1/2 to 3/4 ” cubes, about the size of a large crouton. Heat oil in a heavy saucepan over medium-heat to 350 degrees. In batches, place the cubed plantains into the oil and fry until golden. Use as a topping for the Red-Red stew or eat as a snack. I’m sure you guys realized that a potato recipe would be coming sooner or later. One of Ireland’s favorite ways to use their most famous vegetable is by making boxty. Boxty recipes vary widely: some included mashed potatoes or milk while others didn’t and some had just a smidgen of flour while others included more than a cup. I decided to go with what Darina Allen, a well-known Irish chef, calls Pan Boxty. If you’ve had rösti before, this will look familiar. Everybody else: just imagine a giant latke. In some ways, this pan boxty recipe is unique for what it doesn’t include, namely eggs, wheat flour or onion. You won’t miss them; this boxty is like a giant and buttery hashbrown that’s crispy on the outside and almost fluffy and creamy on the inside. The key to this recipe is the technique. After grating the potatoes and squeezing out the liquid, you let the liquid separate into water and potato starch. You then add the potato starch back to the shredded potatoes. An extra step, but an important one: the starch will help bind the potatoes since there’s no egg or gluten. Also be sure to let the boxty cook slowly, you don’t want to brown the surface before the inside cooks. Single ladies, consider yourself warned…. Wash the potatoes but don’t peel. 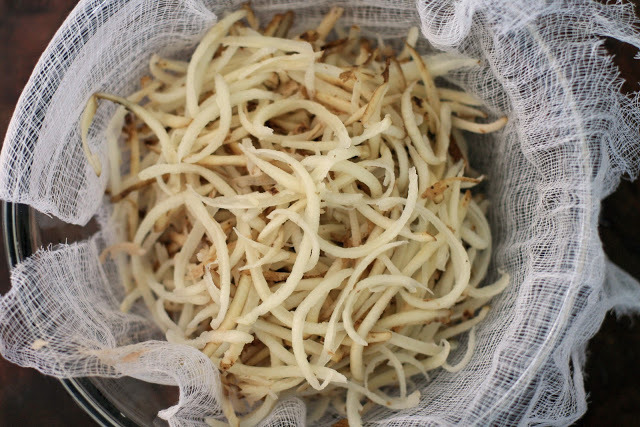 Line a large bowl with several layers of cheesecloth and grate the potatoes into it. Squeeze as much liquid as you can from the potatoes into the bowl and allow it to sit for 15-20 minutes; by this time the potato starch should have settled to the bottom. Carefully drain off the liquid, retaining the potato starch at the bottom of the bowl. Add the shredded potatoes and rice flour to the starch and mix well. Season with salt and pepper. Melt one to two tablespoons of butter in a large, heavy-bottomed skillet over medium heat. Spread the potatoes into the pan; it should be about one inch thick. Let the mixture cook very slowly over medium heat until browned, about 15 minutes, before turning the boxty over to cook the other side, another 10-15 minutes. Add more butter if necessary/desired. 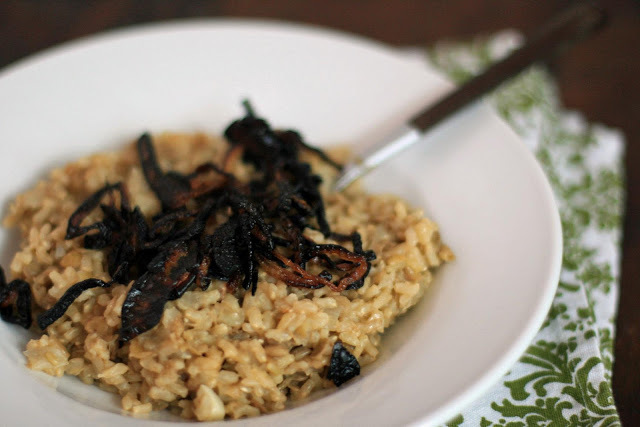 If this Israeli mejadra was in a one-on-one competition with my go-to Indian lentil rice pilaf, it might lose if judged as a one-item meal. The Indian version’s addition of tomatoes, serrano peppers and a whole cumin seed tadka adds a lot more interest and complexity to the lentils and rice. But where this recipe shines (in a wallflower sort of way) is as a side for a variety of meats and fish. It was great topped with salmon with a herb sauce and is much more versatile than its Indian counterpart. Bring 3-4 cups of water to boil in a saucepan over high heat. Rinse lentils and add to cooking water. Bring to a boil and then reduce to medium-low heat and cook the lentils in water until soft, about 20-30 minutes. Drain and set aside. Heat olive oil in a saucepan and fry the onions until they begin to brown. Add the rice and cook, stirring, for 2 minutes. Add the lentils, cumin and season with salt and pepper. Add three cups of water and bring the mixture to a boil. Reduce heat to low, cover and cook for 30 minutes, or until all of the water has been absorbed. Remove from heat and let stand 10 minutes. Serve with fried onions (see below). Halve the onion(s) and slice very thinly. Heat the oil in a skillet over high heat. Add the onions and stir until well-coated in oil. Spread into an even layer. Stop stirring and let the onions cook until the onions on the periphery begin to brown. Stir well and again spread the onions out into an even layer. Repeat until all of the onions are a dark brown. Resist the urge to stir constantly. Drain on a paper towel. Oysters have been an extremely important shellfish to the Irish for centuries and so I thought now was the perfect time to reacquaint myself with these little guys. I’d eaten one raw on the half shell years and years ago at a party. I clearly didn’t love them as much as my fellow party-goers and so I left my share for the hard-core oyster fans and probably diverted my attention to a platter of cheese. The high cost of oysters, along with my cheapskate ways, have kept me away from trying them again in recent years. But a recipe for Oysters Baked in Garlic and Herbs in The Irish Pub Cookbook made me want to give oysters another go. I was blithely unaware of the difficulty of shucking oysters when I bought them… and then internet accounts of oyster shucking gone wrong pretty much scared the pants right off me. Texts were sent out to oyster-loving friends to see whether anybody had an oyster knife I could borrow. Nobody had one. Why? Out here pretty much everybody just throws them on the grill and they open up themselves. 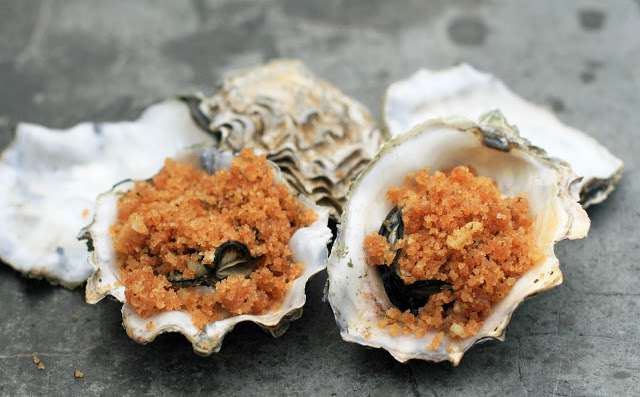 So I rolled with the punches and tweaked my original plan; the oysters got grilled and topped with seasoned, toasted breadcrumbs. Melt butter in a large skillet over medium heat and cook the shallots and garlic until soft. Add the breadcrumbs and cook, stirring, until the breadcrumbs start to turn golden. Add the lemon juice and mix well. Season to taste with the salt and pepper. Add the parsley and mix well. Set aside. Clean the oysters by scrubbing the shells with a stiff brush under running water. Rinse well. 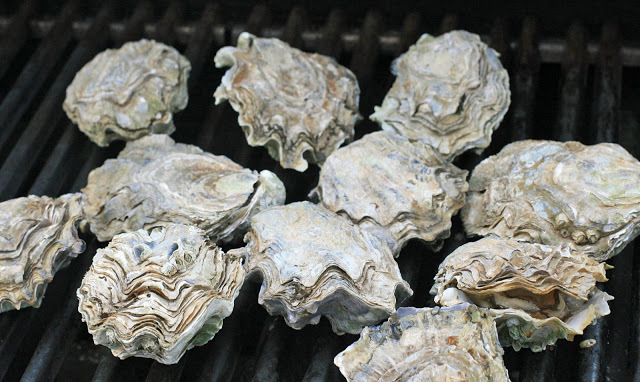 Heat the grill and place oysters on the grill grate so that they’re resting on their deeply curved halves of their shells to ensure that their juices don’t run out. Preheat oven to 350 degrees and lightly grease a 9″ x 4″ loaf pan. Stir yeast into warm water and set aside for several minutes. Combine all of the the ingredients in a large bowl and stir. 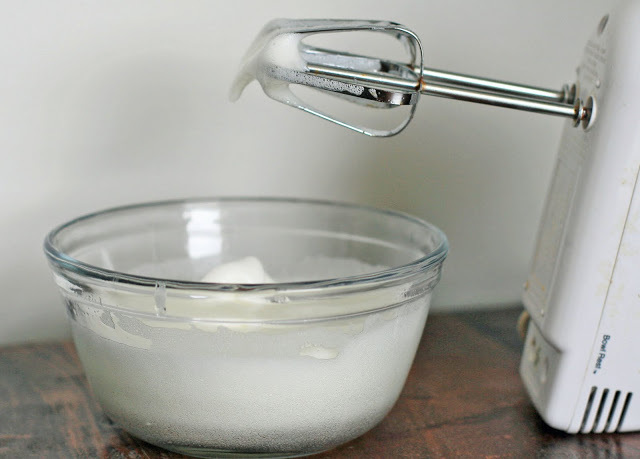 Add the yeast water mixture and use an electric mixer to blend together for one minute on medium speed. Spoon dough into prepared pan and use a wet spatula to spread the dough evenly in the loaf pan. Bake for 40 minutes. Remove bread from the oven and let cool on a wire rack. Slice bread very thinly. 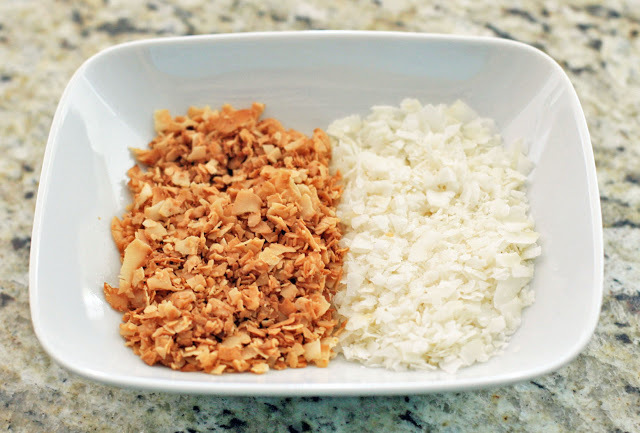 Place slices in a food processor or a blender and process until fine crumbs appear. Store in a tightly sealed container or plastic bag in the freezer. Think you’re not an offal fan? This recipe might just convert you. Chicken livers and chicken breast cooked in a baharat spice mixture, drizzled with tahini sauce and served on flatbread with some greens. The original version also called for heart and spleen, but Whole Foods didn’t carry any. If you’re able to find either- and are an adventurous cook- feel free to add some in. 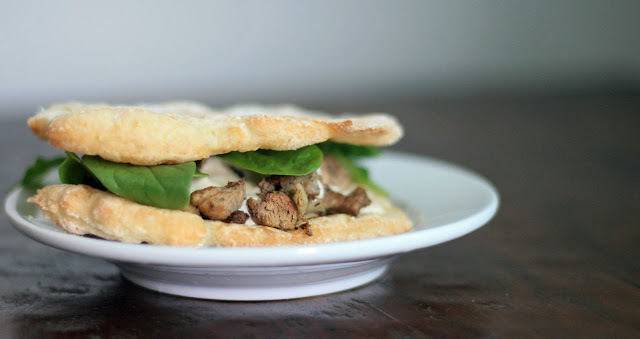 This is also traditionally eaten in a pita, but I haven’t had much luck making my own gluten-free version and so I served it on my favorite new flatbread. I’ll share that recipe tomorrow. Mix the chicken livers and breast with the onions, spices and olive oil. Marinate for several hours (up to one full day). Heat a skillet and add the seasoned meat mixture. Cook, stirring, until meat has cooked through. Serve on a pita, or gluten-free bread (or see my new favorite substitute), with some tahini sauce (recipe follows) and some greens. Mix tahini, lemon juice, and garlic. Add water to desired consistency. It was only after I chose Israel as one of my first culinary destinations that I learned a debate as to whether Israel has its own distinct and unique cuisine existed. Apparently some people argue that Israeli cuisine is really just a collection of recipes from Jewish immigrants as well as recipes from its Arab neighbors. But I’m not interested in the debate- I came for the food. While Malabi is popular all over the Middle East (although it apparently goes by other names as well), it has become a staple dessert in Israel. Wherever it’s from, it’s 100% amazing. I snuck a couple spoonfuls while I was transferring it to my serving dishes. My initial reaction? Meh. After it cooled? Well, let’s just say the eight servings lasted about 24 hours in the house. I topped the malabi with raspberries pureed with rosewater, toasted coconut flakes, pistachios. They were all great. Come summer I’ll be topping the malabi with a strawberry-rosewater topping. Mix one cup of milk with the corn starch to make a slurry. Stir until the cornstarch dissolves completely. Heat the remaining 3 cups of milk, heavy cream, and sugar in a saucepan and bring to a simmer. Pour in the milk and corn starch mixture and cook over low heat until thick. Stir in the rose water. Remove from stove and pour into serving glasses or dishes. Allow to come to room temperature. Refigerate until thoroughly cooled. Top with your favorite fruit, nut, or syrup.